Parsley (Petroselinum crispum) is an herb used in many types of cooking and sometimes used for medicinal purposes. Though usually consumed as a food, parsley is also available in dietary supplement and tea form. Proponents suggest that extracts of parsley's leaves, seeds, and/or roots can help treat a number of health conditions, including digestive issues. For instance, a tea made from parsley seeds is a traditional remedy for indigestion and intestinal gas. Parsley is also often suggested to help reduce menstrual cramps and to help eliminate excess water weight. Some of these claims make sense when you consider the various ways parsley can act in the body. For instance, because of its diuretic effect, one study recommended that parsley be used to help control high blood pressure. In Germany, where herbal medicine is more accepted than in the U.S., doctors often prescribe parsley seed tea for high blood pressure. Still, parsley shouldn't be relegated to the lowly status of just being a garnish. The herb contains a variety of substances thought to influence health, including several antioxidant compounds, calcium, iron, vitamin C, and vitamin K. In fact, less than one and a half tablespoons (about five sprigs) of parsley delivers nearly 100 percent of the daily dose of vitamin K. Getting an adequate amount of this nutrient may help protect against bone health because it helps make the protein involved in bone mineralization. Although parsley has a long history of medicinal use, few scientific studies have looked at the health effects of this herb. That seems to be changing, as some preliminary research shows that parsley—and some of the natural compounds found in it—may offer certain health benefits. Mice exposed to human triple-negative breast cancer cells experienced significantly reduced metastastic growth throughout their body after being treated with luteolin, a natural compound found in herbs like parsley and thyme, reported a 2017 study published in the journal Breast Cancer: Targets and Therapy. Another natural chemical found in parsley, apigenin, holds promise as another non-toxic cancer treatment. In a 2015 study, it was shown to decrease tumor size in an aggressive form of breast cancer. Parsley seemed to help protect against the liver damage commonly associated with diabetes in a 2006 study published in the Journal of Ethnopharmacology. Researchers observed that diabetic rats treated with parsley extract experienced an improvement in several markers of health, as well as a decrease in blood sugar levels. The authors note that antioxidants found in parsley appear to play a key role in the herb's diabetes-fighting effects. Pyrroloquinoline quinone, or PQQ, a powerful antioxidant found in parsley, kiwi fruit, celery, and papaya, can halt or prevent the progression of fatty liver disease in the offspring of mice fed a high-fat Western-style diet, according to research published in 2018 in Hepatology Communications. In a preliminary study published in the journal Immunopharmacology and Immunotoxicology in 2012, tests on cells taken from mice demonstrated that essential oil extracted from parsley may help suppress inflammation and, in turn, aid in the treatment of inflammation-associated conditions such as seasonal allergies. To help manage symptoms of hay fever with parsley, Michael Castleman, an authority on natural remedies and author of "The New Healing Herbs," suggests steeping two teaspoons of dried parsley leaves or root in one cup of boiling water and drinking up to three cups of the brew each day. Fresh parsley is widely available in grocery stores. The two most common varieties are curly, which is commonly used as a garnish, and flat-leaf (Italian), which is more robustly flavored and the better choice for cooking. When buying parsley, look for bright green leaves that look perky, not wilted. To store, wrap parsley in a paper towel, place it in a plastic bag and refrigerate. It should keep this way for about a week. You can also create a "bouquet" by placing the herbs stems down in a tall glass filled with enough water to cover the ends about one inch. The parsley won't last as long this way but seeing it on your counter may remind you to use it. You can purchase dietary supplements containing parsley in many natural-foods stores and other stores specializing in natural products. Parsley supplements and parsley tea are also sold online. You can also make your own tea using fresh parsley that you grow yourself or buy in the supermarket. Parsley is generally considered safe when consumed in normal amounts and in whole-food form when cooking. However, some people may experience allergic reactions to parsley. Because parsley is high in the nutrient vitamin K, which assists in blood clotting, people using blood-thinning medication like Coumadin (warfarin) should avoid taking large doses of this herb. Excessive consumption of parsley should be avoided by pregnant women. Normal food quantities are safe, but consuming excessively large amounts may stimulate contractions. Parsley is a natural diuretic, which means it acts like a "water pill" to cause the body to lose water. Taking parsley along with other diuretics like Lasix (furosemide) and Microzide (hydrochlorothiazide) might cause the body to lose too much water, which may make you dizzy or cause your blood pressure to dip too low. If you take lithium, only use parsley under your doctor's supervision; the herb's diuretic effects may cause lithium toxicity. You may have heard the advice to chew on some parsley to help get rid of bad breath and wondered if it's true. Well, it is. Parsley is a natural breath freshener because it contains the green plant pigment chlorophyll, which can neutralize the odor that's caused by bacteria that live on your teeth and tongue. If you've ever accidentally bought cilantro (aka coriander) instead of parsley, you're not alone—the two herbs do look alike and they're often right next to each other in the supermarket. 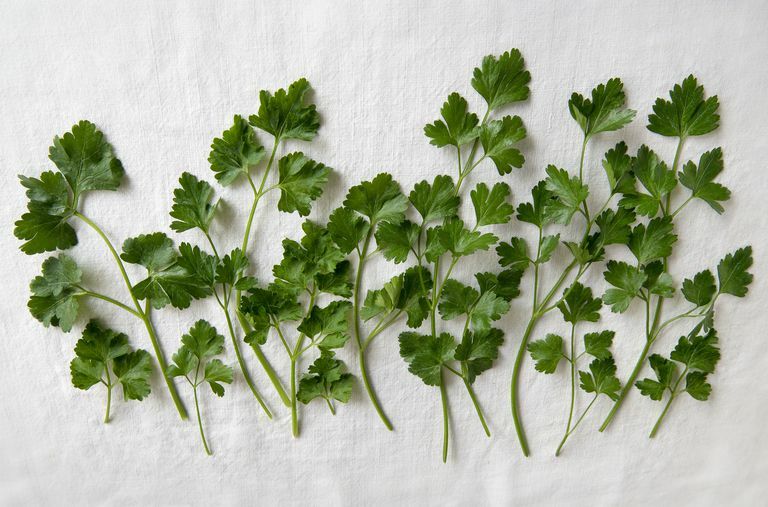 Here's how to tell them apart: Compared to flat-leaf parsley, cilantro leaves tend to be more delicate looking. Besides looking lacy, they're also rounded, whereas parsley leaves usually are pointy. Castleman, Michael. "The New Healing Herbs." Cook Matthew, Yayun Liang, Cynthia Besch-Williford, Salman Hyder. Luteolin inhibits lung metastasis, cell migration, and viability of triple-negative breast cancer cells. Breast Cancer: Targets and Therapy, 2016; Volume 9: 9. Friedman Jacob E., Evgenia Dobrinskikh, Alba Alfonso-Garcia, Alexander Fast, Rachel C. Janssen, Taylor K. Soderborg, Aimee L. Anderson, Julie A. Reisz, Angelo D'Alessandro, Daniel N. Frank, Charles E. Robertson, Becky A. de la Houssaye, Linda K. Johnson, David J. Orlicky, Xiaoxin X. Wang, Moshe Levi, Eric O. Potma, Karim C. El Kasmi, Karen R. Jonscher. Pyrroloquinoline quinone prevents developmental programming of microbial dysbiosis and macrophage polarization to attenuate liver fibrosis in offspring of obese mice. Hepatology Communications, 2018. Ozsoy-Sacan O1, Yanardag R, Orak H, Ozgey Y, Yarat A, Tunali T. Effects of parsley (Petroselinum crispum) extract versus glibornuride on the liver of streptozotocin-induced diabetic rats. J Ethnopharmacol. 2006 Mar 8;104(1-2):175-81. Scherbakov A.M. and Andreeve O.E. Apigenin Inhibits Growth of Breast Cancer Cells: The Role of ERα and HER2/neu. Acta Naturea. 2015 Jul-Sep; 7(3): 133–139. Yousofi A, Daneshmandi S, Soleimani N, Bagheri K, Karimi MH. Immunomodulatory effect of Parsley (Petroselinum crispum) essential oil on immune cells: mitogen-activated splenocytes and peritoneal macrophages. Immunopharmacol Immunotoxicol. 2012 Apr;34(2):303-8. Can Bacopa Sharpen Your Focus?